The success story of Berlin’s fashion industry started in 2003 with the fashion shows Bread & Butter and Premium. Since then, nine fashion fairs have been added as well as two fashion show platforms within the scope of the Berlin Fashion Week, attracting up to 70,000 visitors each year. The MBFW (formerly Mercedes-Benz-Fashion-Week) - starting in 2007 as media-effective platform for fashion design, belongs to the milestones as well as the Berliner Salon from 2007 onward. The Berlin Fashion Week has an additional economic benefit (hotels, gastronomy, retail trade, taxi trade, service providers, etc.) of up to 120 million Euros per season up to 240 million Euros per year. What does the development of the fashion industry look like? The value-added chain of the fashion industry has considerably increased alongside the Berlin Fashion Week. In 2010 the turnover of the Berlin fashion industry amounted to 2 billion Euros and employed about 18,500 people. Read about the current short information on fashion (as per January 2019) with figures from the Berlin fashion industry here (German). About 2,800 enterprises are working in the capital’s fashion industry. The turnover of this industry increased by 13 per cent between 2015 and 2016. 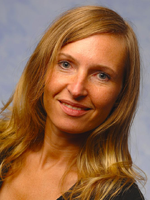 About 5.5 billion Euros turnover were achieved by the fashion industry in Berlin. The figures of employment increased by 2.3 per cent to 25,400 employees in 2017. Which fashion events take place in Berlin? Twice a year brands and labels, purchasers, national and international press media as well as representatives of the fashion industry meet at the Berlin Fashion Week to be inspired by current trends. In January 2019 the Berlin Fashion Week comprise two fashion show platforms (Berliner Salon and MBFW) as well as six fashion fairs under various different headings. They cover the sections Ready-to-Wear, Women- and Menswear, Avant-garde, Street- and Casualwear as well as Sustainable Fashion. Conferences such as #FASHIONTECH Berlin discuss the subject ‘Fashion’ and ‘Technology’ and representatives of sustainable fashion meet at the FASHIONSUSTAIN to show innovative developments. Fashion-related events such as receptions, presentations (Showrooms) and ‘Aftershow’ parties take place at the same time. You will find all fashion events in Berlin as well as news on the Berlin Fashion Week website. How is fashion promoted in Berlin? 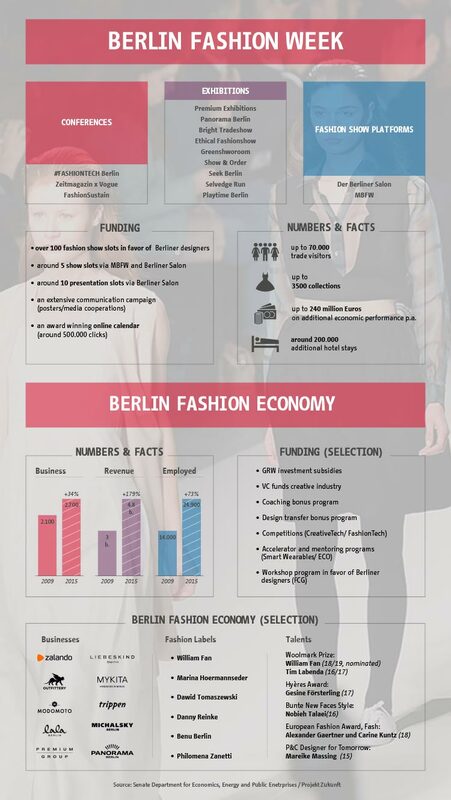 Since 2017 the country of Berlin - and above all the Landesinitiative Projekt Zukunft [Country initiative project future] – has contributed more than 10 million Euros (amongst others without IBB-loan programmes), funds, participations and active support to advance the development of the fashion industry in Berlin and the Berlin Fashion Week. Following start-up finances for the platforms, focus is now - amongst others - on possibilities of presentation within the scope of the Fashion Week, opening up new markets as well as supporting start-ups by mentoring, workshops, and competitions. Workshop programme in favour of the Berlin fashion labels in cooperation with the Fashion Council Germany e.V. Beyond that many programmes of the country are opened up via the Investitionsbank Berlin for fashion-related enterprises - amongst others - unbureaucratic micro loans up to 25,000 Euros, coaching services of the Coaching Bonus programme, loan programmes such as the Berlin Kredit Innovativ programme, as well as participations of the VC Fonds Kreativwirtschaft. Berlin Fashion Week – a versatile trade fair with new forward-looking concepts. New partnerships, wide-ranging commitment and a strong fashion community send out a strong appeal.